Dupuytren's disease typically starts at the age of 50 to 60, though even children have been reported to suffer from Dupuytren's disease (example of a 10 year old boy: "Dupuytren's disease in a child: a case report" Dupuytren_child_abstract). Fig reprinted with permission of Springer from G. Dolmans and H. Hennies "The Genetic Basis of Dupuytren's Disease: An Introduction" in Ch. Eaton et al. (Eds.) "Dupuytren's Disease and Related Hyperproliferative Disorders" (Springer, 2012). Dupuytren's disease seems to be fairly wide-spread in both Europe as in the USA and Canada. A recent survey in Belgium found that 1/3 of the population over 50 shows signs, including sub-clinical symptoms, of Dupuytren's disease flanders_abstract. A recent prevalence study by Lanting et al. in The Netherlands found similar results NL_abstract. In Germany, the current estimate is that about 20 percent of the male population over the age of 50 suffer from Dupuytren's, while 40 percent over the age of 80 are affected. In absolute terms, this amounts to a lot of people: in Germany alone the number of sufferers is estimated to 1.3 - 1.9 million people, and considering the results in Flanders, the actual numbers in Germany are likely even higher. Fig reprinted with permission of Elsevier from Douglas Ross "Epidemiology of Dupuytren's Disease" in R. Tubiana and G. Rayan (Eds.) "Dupuytren's Disease" Hand Clinics 15 (1999). Research papers often report that men acquire Dupuytren's disease x times more often than women with x mostly varying between 2 and 9. Those data typically result from counting patients who get treated for Dupuytren's contracture and may be somewhat misleading. The above picture shows that the onset of Dupuytren's contracture is typically 10 - 20 years earlier for males, with men at the ages of 30 - 40 acquiring it about 6 - 8 times more often than women. This results in more men getting treated which in turn creates the reported relations. Otherwise the disease characteristics seem to be the same for men and women, e.g. MU Anwar et al. "Results of surgical treatment of Dupuytren's disease in women: a review of 109 consecutive patients" J Hand Surg [Am] 32 (2007) p 1423-8 conclude " Dupuytren's disease is less prevalent in women but its symptomatic presentation is similar to that in men, with more severe involvement of the PIP joint and a similar recurrence rate. The surgical outcomes, however, were equivalent with regard to final contracture correction, recurrence, and complication rates." 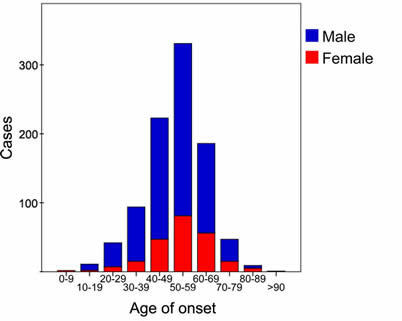 Age and gender dependence of stage 1 of Dupuytren's contracture according to I. Degreef and L. De Smet "A high prevalence of Dupuytren’s disease in Flanders" Acta Orthop Belg 2010, 76: 316-320 . 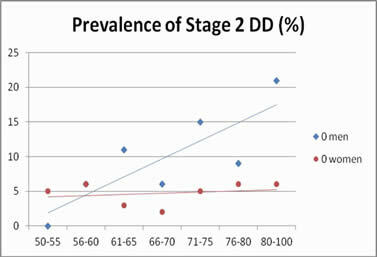 Age and gender dependence of stage 2 of Dupuytren's contracture, same paper as left picture. The earlier onset for men is still slightly visible for stage 1. 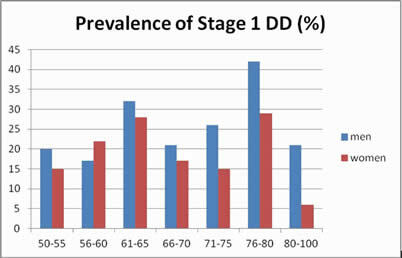 When looking at the prevalence of stage 2 it is obvious that the percentage of male patients increases strongly with age while the percentage of female patients is nearly independent of age. The reason remains unclear, the authors speculate about a more frequent traumatic influence for male patients. The reason why Dupuytren's starts earlier for men or develops faster for men is unclear. One of the few papers assessing this aspect is e.g. A. Pagnotta et al. "Androgen receptors in Dupuytren's contracture" J. Orthop. Res. 20 (2002) 163-168 abstract. Different from the picture shown above, research indicates that above the age of 80 the percent affected is about even for men and women (see e.g. the thesis of J.P. Moermans, Mikkelsen in the above cited paper find a male:female ration of 1.2 : 1 for age 85 - 89). Men are suffering from progressed stages due to the earlier onset. S. Anthony at al. "Gender Ratio of Dupuytren's Disease in the Modern U.S. Population" (Hand. 2008 Jun; 3(2): 87–90) analyzing patients from the Boston area are finding that "the ratio approached 1:1 with increasing age" full_text. Some results even indicate a lower percentage for men above 80 which is explained by an increased mortality of Dupuytren patients (see Wilbrand et al (2005), Gudmundsson et al (2002), and Mikkelsen et al. (1999) ). The reason for this increased mortality, if it exists, remains unclear. Probably due to genetic factors, there are also geographic variations. Dupuytren's contracture is frequent in Middle and Northern Europe, in Australia, and in North America. It exists but is, probably, less frequent in Africa and Asia, though recently Dupyutren's patients have been reported in Japan, China, Africa, India, and Thailand. Examples: D. Slatery "Review: Dupuytren's disease in Asia and the migration theory of Dupuytren's disease" ANZ Journal of Surgery 80 (2010) p 495–499 full_text, G.I. Muguti and B Appelt "Dupuytren's contracture in black Zimbabweans" Cent Afr J Med 36 (1993) p 129 - 132, A Gebereegziabher et al. "Dupuytren’s contracture in Ethiopia" J Hand Surg Eur Vol. 2016 Mar 24 abstract ("We conclude that there are more cases of Dupuytren's contracture in Ethiopia than previously thought. "); Ch-CH Yeh et al. "Epidemiological profile of Dupuytren’s disease in Taiwan (Ethnic Chinese): a nationwide population-based study" BMC Musculoskelet Disord. 2015; 16: 20 full_text ("prevalence of Dupuytren’s disease and the male/female ratio were significantly lower in ethnic Chinese than in Western ethnic groups"); and S. Srivastava, J.D. Nancarrow, D.F. Cort "Dupuytren's disease in patients from the Indian sub-continent. Report of ten cases." J Hand Surg [Br] 14 (1989) p 32-4 "We believe that Dupuytren's disease among Indians is not so rare as previously thought. "; and H. S. Cheng et al. "Needle aponeurotomy for Dupuytren's contracture." J. Othoped. Surgery (Hong Kong) 16 (2008) p 88-90. While on average about 1-3 percent of the total population in Western industrial countries are affected, the percentage varies between countries and is very high e.g. in Australia, France, Ireland, and Scotland with 17 percent of the total population. Additionally, the percentage increases with age. In the USA, it is estimated that approximately 25% of middle-aged or elderly individuals develop palmar or plantar contracture (Dupuytren's contracture or Ledderhose's disease,respectively, source: emedicine). Recent research in Flanders, Belgium, found 32 percent of the people above 50 showing palpable signs of Dupuytren's disease flanders_abstract. While there might to be a link to people with Northern heritage the theory that Dupuytren's contracture is a Viking or Celtic disease is probably wrong (see also R. McFarlane "On the origin and spread of Dupuytren's disease" J. Hand Surg. (Am) 27 (2002) p385-390 link_abstract). The earliest reported case of Dupuytren's disease is an Egyptian mummy dating back 3000 years (full_text_Spanish). A good picture of the mummy's hand is in http://www.nba.fi/fi/File/1140/hautakaivausjulkaisu.pdf (page 100, fig 6 F-G). The picture below shows percentages of the population with Dupuytren's in various countries, with high percentages e.g. also in Spain and Japan, thus disproving the theory that Dupuytren's contracture is a Viking or Celtic disease. Note that the percentage depends on the average age of the samples and the disease definition which is not the same for all countries in the figure below. 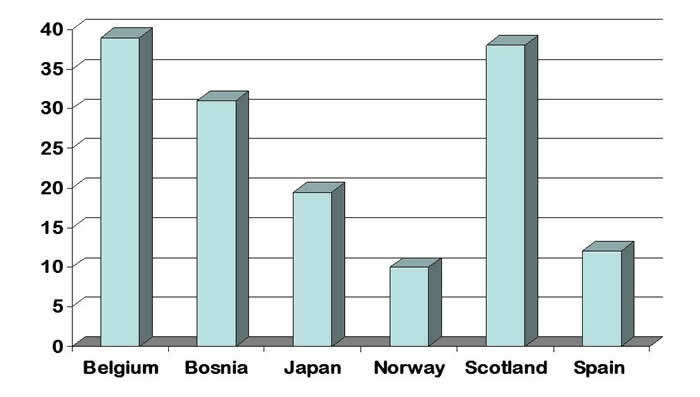 Male prevalence of Dupuytren's disease in Belgium (Degreef 2011), Bosnia (Zerajic 2011), Japan (Egawa 1985), Norway (Mikkelsen 1972), Scotland (Lennox 1993) and Spain (Guitian 1988). Missing reports on Dupuytren's contracture e.g. in Mediterranian populations may be in part due to missing studies. A recent survey of Bosnia-Herzegovina (above figure) showed very high prevalence in the Croatian and Serbian population (up to 75 percent for men above the age of 75) and low prevalence for the Muslim population. "However, as there are no true ethnic differences between the populations of Bosnia and Herzegovina, only religious and social differences, it is surprising to find lower prevalence among Bosnian Muslim than Bosnian Serb and Croat men. It is possible that this is a spurious finding, particularly as no such difference was found among women, but it may also be due to some, as yet undetermined, difference in social factors." Full_text_Dupuytrens_Bosnia.